If you are outside working in your garden, or just enjoying the many flowers that bloom throughout the growing season, then you may happen upon ladybugs or lady beetles. The most common ones in this area, though, are not native to North America. Coccinella septempunctata or the seven-spotted lady beetle is known as the Ladybird of Europe and was first introduced in the 1950’s to control aphids. Most have seven black spots on a red or orange body. Usually there are three black spots on each elytron (the hardened forewing) plus one black spot bridging the two elytra with a whitish patch on either side. Seven-spotted lady beetle. Copyright Mary Free. 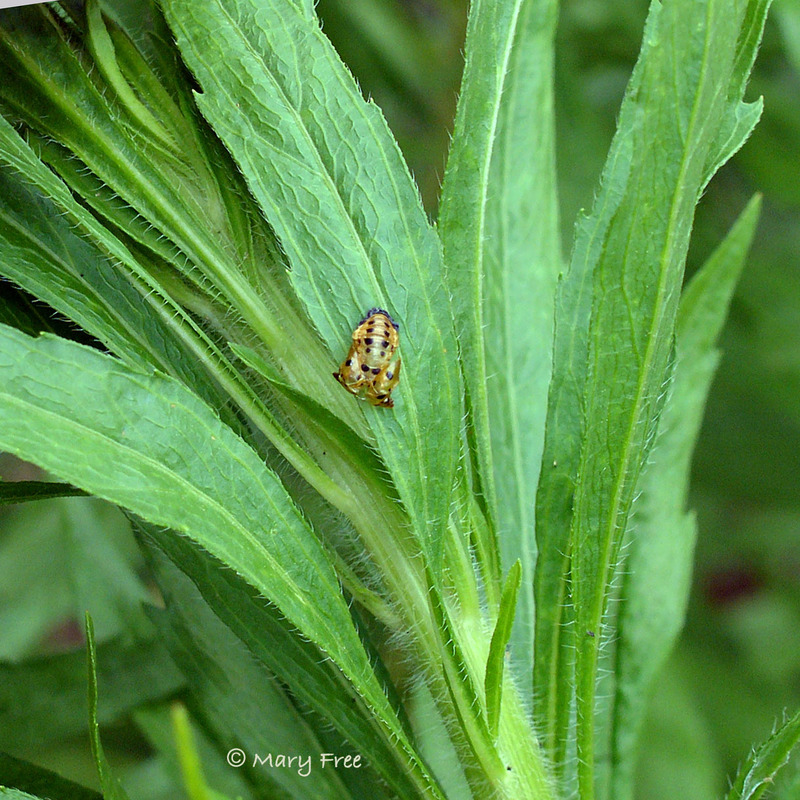 Seven-spotted lady beetle pupal casing. Copyright Mary Free. Harmonia axyridis or the multicolored Asian lady beetles were introduced in the 1970’s to control agricultural pests such as aphids and scales. Their colors range from amber to orange to red. They may have no spots, a few black spots or up to twenty or more spots. However, their common feature is a white “M” or “W” shaped mark behind the head on the pronotum. 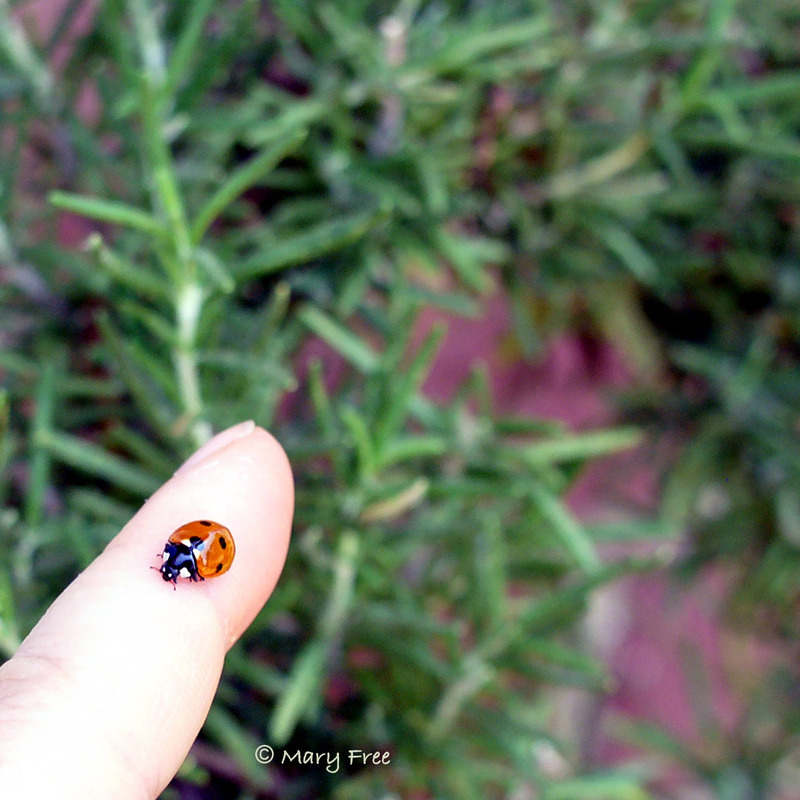 Asian lady beetle on Perovskia atriplicifolia ‘Filigran.’ Copyright Mary Free. Asian lady beetles have become invasive in some areas and can be particularly annoying in the fall if they invade homes or buildings looking for shelter for the winter. They do not eat or breed indoors but when disturbed their secretions can stain clothing and other material. If you find an infestation, vacuuming them up is an effective way to remove them. 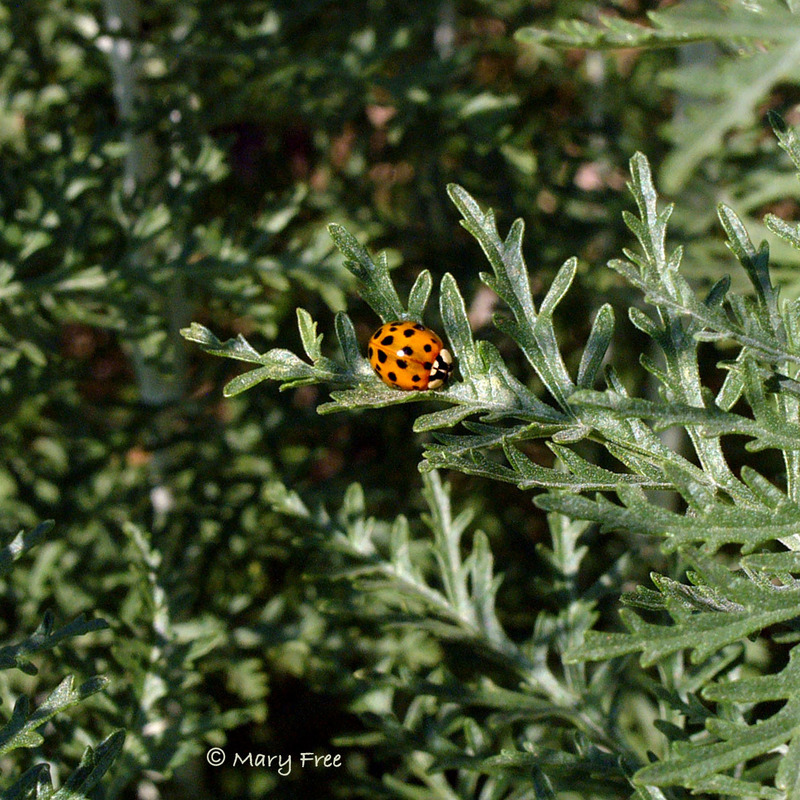 Overall, lady beetles are beneficial insects. They go through complete metamorphosis. Although they are easily recognizable in their adult form, some people mistake their surprisingly different larval forms for garden pests. The lady beetle larvae are often said to resemble tiny alligators. They have voracious appetites preying on insect pests; and unlike alligators, they do not harm people. The larval instars increase in size after each molting. In their final pupal stage, they attach themselves usually to a leaf. In time lady beetles emerge with soft elytra that soon harden into the form with which we are so familiar. Asian lady beetle pupa on Perovskia atriplicifolia ‘Filigran.’ Copyright Mary Free. Asian lady beetle emerging from pupa on Perovskia atriplicifolia ‘Filigran.’ Copyright Mary Free. This entry was posted in Beneficial Insects and tagged Coccinella septempunctata, Harmonia axyridis, ladybug, multicolored Asian lady beetles, seven-spotted lady beetle. Bookmark the permalink.